Training dogs for agility is an up and down journey. Even with the most confident, drivey dogs that is the case. With an incredibly fearful dog with no drive, it can be extremely painful, but when things finally start to come together, it is most rewarding! Those who have followed my struggles with Pankies (aka UPGRAYEDD, Uppity, Uppity Puppity Piddles When You Pat Her Pankin Pants Poodle, Pankins, Pankinstein, etc.) know some of the highs and lows I have experienced training this remarkable dog over the past four years. When it became clear at 7 ½ weeks of age that there was something not right in her head, I knew I had to keep her. I had bred the litter to get my dream dog but what I got, or thought I got at the time, was a nightmare. I have written many blogs about Pankies over the years so I won’t go into all of our struggles, but the short version is that she had zero drive, zero interest in training or working with me, zero toy drive and at times, she didn’t even like me much. She didn’t like anyone or anything much for that matter. I shed a few tears during our early training. I had never struggled so hard to train a dog in my life. There were more than a few people who suggested I quit and get another dog or place her in a pet home. The problem was that I knew most pet owners would not be equipped to deal with her incredibly tricky and, at times, disagreeable temperament. It wasn’t until this past year that I considered giving up. She would just sit at the startline staring and not move when I released her or she would run the fence looking for a way out. Then, there were the contact issues. Her A frame was decent and her dog walk was at times brilliant and at other times dismal. Her teeter would go from a Border Collie slide to a NO GO! NO WAY JOSE! I think I have retrained the teeter from the ground up more than a dozen times. I would get her sliding and looking GREAT, then some little itty bitty thing would go wrong and she would refuse to have anything to do with it. I would go from higher than a kite to lower than a snake’s belly! Every time she quit, my incredible instructor and friend, Stacy Winkler, would talk me off the ledge and suggest ways to fix it. I would work even harder. Sometimes I would get out there in the early morning in my bathrobe and flip flops with her food dish doing teeters. It always got better until something happened to scare her and we would be back at square one again. Last summer I learned at an AKC B Match (I wish ALL trials would hold B matches at night after trials!!!! They are invaluable!) that if she saw her sister Barque do the teeter at a strange place, then it was OK for her to do it. Sir Cussalot and I would pay for our runs and I would have Pankies in the ring watching Barque do the teeter, then we would do it. That helped, but when she was on her own in competition, the fear would override all else. Even though she has her MXJ a few times over, we had never entered a standard class until a couple of weeks ago. Sir C was bugging me to try, so I caved in and agreed. I had entered her in some FAST classes a few times. She did her teeter once but refused to do it after that. That seemed to be her MO. For some reason, she hates the teeter at trials. She slides her own and will do others well if Barque does them first but once she sees the teeter is different, NO WAY! This weekend was a bad chemo week for me. I had three hours in the hospital and went home with my chemo pump for two days. Sir C unhooked the pump from my port on Wednesday and I drove to the trial Thursday. It was tough. I felt like crap! On Friday morning we had FAST. Pankies was AMAZING! Her A frame was pretty good. We had a miscommunication going to the send but we recouped and she nailed it! The problem was that I was still reacting very badly to cold and it was FREEZING up on the hill at the City of Industry trial site. I wrapped up in a scarf my friend Carol gave me and wore my gloves, but sucking that cold air caused my throat, windpipe and lungs to seize up. The only way I can describe what happens is to relate it to a shock collar. If you have ever touched one, that is how it feels. It starts in my fingers. They tingle as if the collar were on the lowest setting. The same happens to my mouth and nose. My sinuses burn like hell. As the exposure to the cold goes on, the tingles gets worse. The shock collar goes from a 1 to a 4 to a 10! By the time it gets to a 10, my muscles begin to cramp and freeze up. After that, everything starts running and I mean RUNNING! My eyes, nose and mouth all water like crazy. Then the sneezing starts. Add terribly annoying weakness and fatigue to the mix and you get the chemo picture. Now, imagine this happening in the middle of a run. That is exactly what happened to me Friday morning. About half way through the run, I felt it escalating and just prayed I could get through it and finish the run. Then, as Pankies approached the teeter, everything froze. I couldn’t breathe! I felt like a three hundred pounder with asthma running up a five mile hill with no inhaler! Then the wheezing began. It got louder and louder. I knew it would scare Pankies as she was approaching the teeter. I tried hard not to breathe but my body was demanding I at least try. Much as I tried to stay quiet, the wheeze took over. Pankies approached the teeter cautiously, but did it very nicely! I tried to tell her good girl but the words just sounded like jumbled wheezing. I sent her to the backside of the next jump and headed out. By now I think people could hear me wheezing in the next county. It was embarrassing. Pankies was so freaked out I couldn’t catch her to put on her leash. She looked at me like I was a three headed alien going to eat her. Finally I asked her to sit and she did. I buckled her collar and out we went. By now, I was not only wheezing but liquid was flowing from every orifice on my face. My eyes were pouring tears, my nose was running like Niagara Falls and I was drooling like a starving dog at the dinner table! A woman was sitting outside the ring as I exited. The look of horror on her face said it all. I knew I had to look and sound pretty dang bad. I thought I might drop dead right there. But what a way to go. 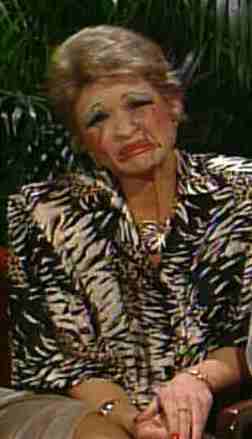 Good thing I don’t wear makeup or I would have looked like that infamous photo of Tammy Faye Bakker! For those too young to remember that photo, I am so sorry you missed that classic. I hung out at the wall outside the ring until I could breathe again without sounding like a broken radiator, then I slowly worked my way back to the set up to collapse. I was supposed to run two more times but I couldn’t. I asked Sir C to try and I struggled up the hill of the parking lot to the Global Warmer. I took off my shoes and climbed into bed and dozed off to sleep. Pankies wanted her Gramma. She ran OK for Sir C, but they struggled in jumpers and she wouldn’t do her teeter or her A frame in her novice standard class. She is Gramma’s girl through and through. Back to the drawing board. The dog will be 12 before she ever gets into Master standard! The next day I felt slightly better. Everything still tingled in the cold. A friend gave me chemical hand warmers and they were a miracle! I never would have made it through the day without them. We started with Time 2 Beat. There were two A frames – no teeter. She did well and qualified! We Qed in jumpers but she took the scenic route twice; once out of the tunnel and once when she went the wrong way on a 180. It was pretty dang funny. She did a figure eight around the 180 but we still managed to hang on for the world’s ugliest Q! Standard started out amazingly! She was flying. Her A frame was pretty good. Her dog walk was awesome. Then we came to the teeter. NO WAY! The judge was very close and walking towards her. I think that didn’t help much. I gave it a few tries, then decided to cut my losses and leave in shame. Sunday started off with Time 2 Beat. I debated whether or not to run her if there was a teeter. I walked the course and figured we would go for it. She was very versited. It was early and she was as fresh as a fit race horse on a cold windy morning! She got up at the start. I should have expected it because she was scooting at the start the day before. I told her to sit but she just glared at me. I took my chances and led out (I really need to be careful about the hill on which I choose to die with her). She stayed put. I will deal with that this week. It was three straight jumps to a tunnel. I pulled her to the near end but neglected to release her in time. She danced around waiting for further instruction. Once given the tunnel cue, in she went. Then it was up over the A frame and around to the weaves followed by a big loop to the teeter. I sent her to the weaves and took off waddling towards the teeter. I had not planned to do a front cross in front of the teeter but I had plenty of time and went for it. By the time Pankies came around to the teeter, she didn’t have time to think about it. She was too busy trying to figure what the heck I was doing. She was up and over the teeter before she knew what hit her. I was so proud of my Pankies! Then we were home free. We also Qed in jumpers. Our time was not great though. It was a runner’s course and I AIN’T NO RUNNER! I had to call audibles from afar but she got all of them! We had wide turns to go along with her questioning choices, but we made it all the way through. So now I will try to get her on as many strange teeters as I can find. She is not a dog that generalizes well but I do think I see a tiny light at the end of the teeter. We packed up and headed home. I went for Stuporboawl vegan Pizza and all was well. All in all a pretty dang great weekend. You were really moving yourself. Love the distance you get on her and lovely independent weaves, I think she does great. For someone who had surgery and is going through chemo, you are amazing. You must just love doing agility. I watched the dog agility before the super bowl and you are much better. But the frisbee champ was pretty amazing too. The Seahawks need no comment from me. They were pretty stunning. I had a dog (papillon Gizmo) who refused to do the table at trials. One day I did a front cross before the table and he jumped right on! Just to be sure, the next day I didn’t front cross and he didn’t get on it. I front crossed before every table for a year, after that he’d get on without it. Silly dogs. #1 on my poodle and person Heroine list! I’m extremely impressed with you and Pankies! YOU ARE AMAZING!!! Enough said! Congratulations! I love hearing about dogs teams that have worked hard and finally start to see some light. Have you ever tried wearing one of those hot patches for sore muscles? I noticed once when my back was out that wearing that hot patch kept me cosy. It might help you keep your body heat a bit. Helen, both you and Pankies look great! She does have drive and her tail wags a lot!